Researchers at the Mayo Clinic have succeeded in creating a spinal cord implant that can give mobility back to paralyzed patients. In a world’s first, Mayo Clinic doctors have managed to make a paralytic man walk again using a spinal cord implant. Though he still can’t sense his legs, many people could benefit from this breakthrough. In February 2013, a snowmobile accident left Jered Chinnock from Tomah (Wisconsin, Minnesota) paralyzed from the middle of his back down. Another snowmobile hit Jered after he was thrown off of his, damaging the spinal cord in the middle of his back along with puncturing his lung and breaking his ribs. As a result of the three spinal fractures at the level of the sixth thoracic vertebra of Jered, the link between his brain and neurons in his legs was cut and he could no longer move or feel any sensation below the injured area. Now 29, Jered, after relying on a wheelchair to move around in the last five years, was able to overcome his spinal cord injury (SCI) thanks to Mayo Clinic doctors. Researchers at Mayo Clinic have been working for years on a pioneering research project that through Epidural Electrical Stimulation (EES), along with physical rehabilitation, seeks to help spinal cord injury patients regain volitional motor control. In 2016, Jered Chinnock became the first patient ever to benefit from EES therapy at Mayo Clinic. Neurosurgeons implanted an electronic stimulator in the epidural area of Jered’s back, where his spinal cord was fractured. The device acts as a bridge between the brain and neurons by establishing an electrical connection. The Wisconsin man and father of one was able to stand up independently and make steplike movements while his body weight was partially supported. One important thing for Jered was bowhunting, which helped him cope and get through intense physical therapy sessions, and he might be able to do it with a better balance now. “It was almost mind-blowing. Right away I was able to move my toes, something I haven’t seen in a while,” said Chinnock, who didn’t think he’d walk again, after doctors turned on the electrode in his back. Jered hasn’t cured his spinal cord injury as he still can’t feel any sensation in his legs even if he can control them down to his toes. But this medical breakthrough would benefit many SCI survivors and help them overcome part of the physical and emotional toll that spinal cord injuries take on them. The Christopher and Dana Reeve Foundation partly funded this research. The late Superman actor spent the last 9 years of his life (1952-2004) paralyzed from the neck down after he fell off of his horse. 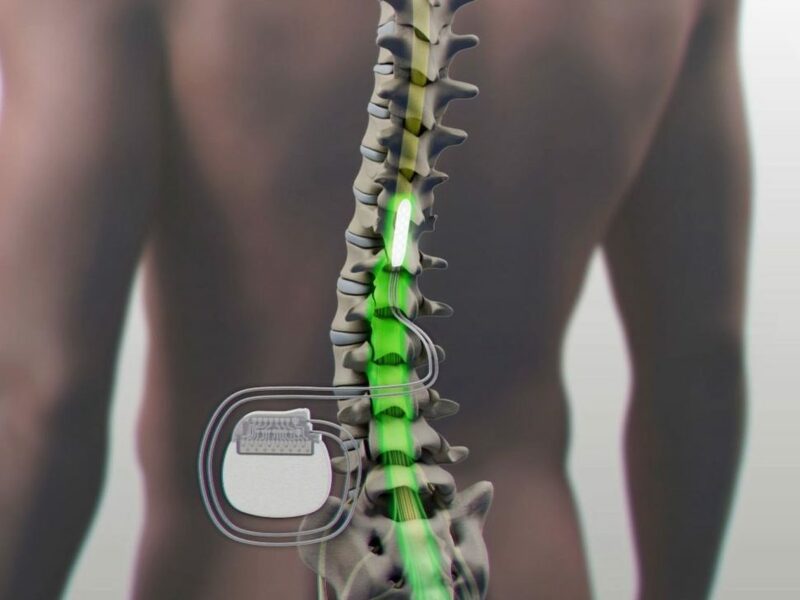 Do you think there are any alternatives to this form of spinal cord implant?